Save up to 70% this month at www.cawineclub.com. A winery named Llai Llai from a place called Bio Bio? This may sound like a wacky play on words, but keep these double-your-pleasure names in mind: Chances are you'll be seeing and hearing (not to mention tasting) more about Llai Llai Bio Bio in coming months. Llai Llai, pronounced "lie-lie," means "strong wind" in the indigenous Mapuche language of Chile's Bio Bio Valley. * It's made by Vina Corpora (VC), which is one of Chile's larger wine producers, but not one that has seen much export to the U.S. Recently, however, it came into the portfolio of respected importer W.J. Deutsch & Sons, a firm that earned much of its reputation years ago by inking a similar agreement with a then-little-known Beaujolais firm named Georges Duboeuf. It didn't take long for Duboeuf to become a household name; I wouldn't be amazed to see Llai Llai gain a fan club of its own. * Its vines are grown in the Bio Bio Valley, which lies about 300 miles south of Santiago, the capital, and about 30 miles inland from the Pacific Ocean. Its cool, maritime climate, its producers say, provides ideal conditions for growing the classic Burgundy grapes Pinot Noir and Chardonnay. * Enhancing that Burgundian connection, the wines were made with advice from French-Canadian experts with years of experience in Chablis, for the Chardonnay, and Burgundy, for the Pinot Noir. Indeed, in my tastings (detailed below), I detected more than a whiff of Burgundy in a wine that speaks of both the Spanish-speaking New World and the terroir-driven Old. They're clean, subtle and complex, with distinct touches of intriguing minerality. At U.S. prices ranging from $11 to $15 (per Wine-Searcher.com), they ought to fly off the shelves. W.J. Deutsch enjoys national distribution; if your local wine shop doesn't have Llai Llai, it should be coming soon. I'd like to introduce you all to a new columnist on WineLoversPage.com, Taylor Eason, who describes herself as a Southern foodie and wine writer, which, hey, sounds a bit like me. She writes a wine column, too. It appears regularly in Memphis magazine and is syndicated through Featurewell Syndicates. I'm a big fan of Taylor's writing style, which is breezy, conversational and aims at making wine accessible and fun with zero snob factor and without "dumbing it down." I like to think we have that in common, too. Check out her first submission in our pages, The art of reading restaurant wine lists; and keep your eyes open for more, as I hope she'll be contributing often. And if you like this newsletter, I'm confident that you'll like Taylor's Email wine letter, too. Hasten over to her Website, TaylorEason.com, and register in the simple form marked "Free weekly newsletter" on the right. Taylor, a graduate of Switzerland's Ecôle Hotelière de Genève culinary management program, was born in Atlanta and now lives in Tampa with her husband, Scott, and their wine collection. $1 Shipping wine sale is back at The California Wine Club! Save up to 70% this month at The California Wine Club. Put money in your pocket and great wine on your table with this month's $1 Shipping Spring Wine Sale at The California Wine Club! Visit www.cawineclub.com or call 1-800-777-4443 to order. * Award-winning wines as low as $9.99! * Cabernet Super Savers at up to 60% off! * Limited production international selections from Italy, Spain, Australia and France! * 90+ rated Pinot Noirs, Syrahs, Zinfandels and more! Half, full and mixed cases are okay. Every case ships for just $1. Stock up now. Visit www.cawineclub.com or call 1-800-777-4443, we love talking wine and will be happy to help you choose your selections. FOOD MATCH: Although this Chard isn't made in the "buttery" style, nevertheless butter and fresh sage over spaghetti makes a great match with this Chard. It would pair well with roast chicken, pork or richer fish such as swordfish or sea bass. FOOD MATCH: I served it with "loaded" baked potatoes stuffed with Cheddar, broccoli and ground bison. A versatile Pinot, it would work well with just about any red meat, flavorful cheeses, mushrooms and more; even wild salmon or fresh tuna. VALUE: Both wines offer very good value in the lower teens. 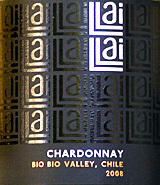 Compare prices and find vendors for Llai Llai Chardonnay and Pinot Noir on Wine-Searcher.com.